Last month during the A - Z Challenge I wondered my way into joining a blogger's book club over at The Armchair Squid. I have never belonged to a book club before, mostly because between the kids and work and classes and stuff I don't have armloads of time to show up for meetings and talk to people. Which is why this is awesome because as anyone who has ever been in my house can attest to, I love books! Now, I am a big (HUGE) fan of both of the above mention authors so the fact that I have owned this book for I don't know how long and haven't read it is actually a shock to me. A big shock. That's like buying shoes and not wearing them. 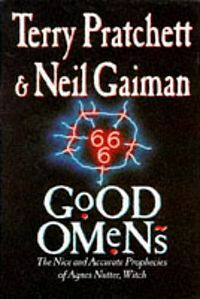 Anyway, Good Omens was awesome right from the start, it is far from your normal end of the world story. (if there really is such a thing as a normal end of the world story) It has fantastic characterization, I think Crowley might be one of my favorite characters in a book ever. (after Death of course, I LOVE Terry Pratchett's Death) You have the Four Horsemen of the Apocalypse (who are wonderfully devious), an eleven year old Antichrist, a hell hound who isn't, and the forces of heaven and hell. I really enjoyed it and I highly recommend it to anyone who hasn't read it, if such people exist. Good choice. When I read this I was impressed by its consistent cleverness. I found a smile on most of the pages. I really need to check out this book sometime. I've never read anything by Terry Pratchett before, but I have read a bit from Neil Gaiman, so I'd likely enjoy this! Gaiman's hit or miss for me. I loved Coraline (the movie - haven't read the book yet). He also writes Doctor Who episodes from time to time and "The Doctor's Wife" is wonderful. On the other hand, "The Sandman" grossed me out. Thanks for participating, Melissa Ann! I agree, this is a great solution for busy, book-loving parents. June's blog list is up and running. I haven't read this one...and I also have shoes I haven't worn :-) I either love Neil Gaiman's work or hate it. This one sounds like it's worth a try for the characters alone. Love this one. It became an instant favorite. Absolutely adored this book. It was a nice break from the usual for me. I've read a fair amount of Gaiman but this is my first Pratchett: friends tell me you can really tell the Pratchett from the Gaiman when you know them both. I definitely want to read more of him. I'm not sure if I've read either author, mainly because this isn't a genre a prefer all that much. I love your enthusiasm for it though! If only more people would enjoy reading like you do then wouldn't the world be a better place? I think so!